Histon lies just four miles north of the centre of Cambridge and with its sister village of Impington straddles the B1049. The village was well established by 1066 and retains much of its ancient heritage. Flint tools have been unearthed and aerial photographs reveal evidence of Iron Age and Roman settlement. The derivation of the Saxon name “Histon” is obscure but “farmstead of the young warriors” or “a landing place” have been suggested. However Histon, being just south of the true fen and above the mediaeval floodline, makes the later meaning unlikely. 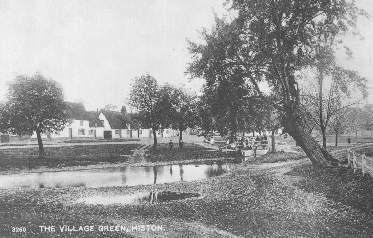 Fed by thirteen kilometres of watercourses, the Brook flows through Histon widening at the Green with its pump, thatched cottages and ducks, to continue north west where it eventually joins the West River. The farmland is stiff clay over gault, loam and gravel. It was fertile enough to support crops of hemp and saffron in earlier days, but cereals and sheep predominated until the spectacular growth of market gardening and fruit production in the nineteenth century. Church End is the oldest surviving part of Histon and was the focus of development from the eleventh century. It has a fine cruciform parish church dedicated to St. Andrew, Histon Manor, a mediaeval moat, the sparse remains of a second parish church which was largely demolished in the sixteenth century and, as well as several timber framed cottages, it has a forge and a two hundred year old brick abattoir. Nearby stands “Stone Corner Cottage”, a thirteenth century hall house. Close to the Green which is to the east of Church End, the ”Rose and Crown“, the thatched farmhouse by the village sign, the red brick “Olde House” with its priest’s hole and “The Boot” public house are all Tudor survivals. A great stone carried by Moses Carter , the Histon Giant, remains at “The Boot”. Market gardening in the nineteenth century brought prosperity and the building of chapels and beer houses! Of Histon’s twelve Victorian hostelries only six remain. The village chapels and churches continue to flourish! The construction of the Railway in 1847 and the success of businesses like Chivers Jams and Unwin Seeds, stimulated some village growth (much of that on the boundary with Impington) but most has occurred in the last fifty years: the population rising from fifteen hundred to four thousand souls. Despite extensive housing development and the erection of the modern “Vision Park” office buildings, Histon, like its neighbour Impington, remains a thriving community independent of Cambridge.